Standing in front of a North Carolina audience on November 24, 2015, Donald Trump mocked a reporter with a physical disability. He has now repeatedly denied mocking him, knowing him, meeting him. Is there anybody that doesn’t know Don never forgets a person he feels belittled “The Donald”? He often sues those people, in fact. After repeatedly being confronted with debunking of his statement, Trump eventually referred to this Washington Post article written by Kovaleski a few days after 9/11 as proof of his veracity. Kovaleski’s piece offers background into the existence of terrorist people in northern New Jersey based upon the arrests made in the 1993 World Trade Center bombing and further law enforcement investigations. There is no mention of thousands of people cheering or dancing. In Jersey City, within hours of two jetliners’ plowing into the World Trade Center, law enforcement authorities detained and questioned a number of people who were allegedly seen celebrating the attacks and holding tailgate-style parties on rooftops while they watched the devastation on the other side of the river. A similar line, also unattributed, had appeared via Associated Press story the day before. Trying to track down that thread of “facts” didn’t turn up much one way or the other. There are many threads on Reddit and some Stern fan pages, but nothing of substance to support the rumor or the chain emails. I have no idea who this reporter, Serge Kovaleski, is, what he looks like or his level of intelligence. Despite having one of the all-time great memories, I certainly do not remember him. There are hundreds of examples through the years of Trump remembering people, that’s what a guy like him does, he’s a politician. More importantly, grudges and revenge are important to thin skinned people that immediately attack as a defense against any perceived slight, and Kovaleski was not complimentary of Trump on several occasions. Kovaleski suffers from arthrogryposis, a congenital disease. In Kovaleski’s case, the disease caused joint contracture and mobility limitations of his arms. 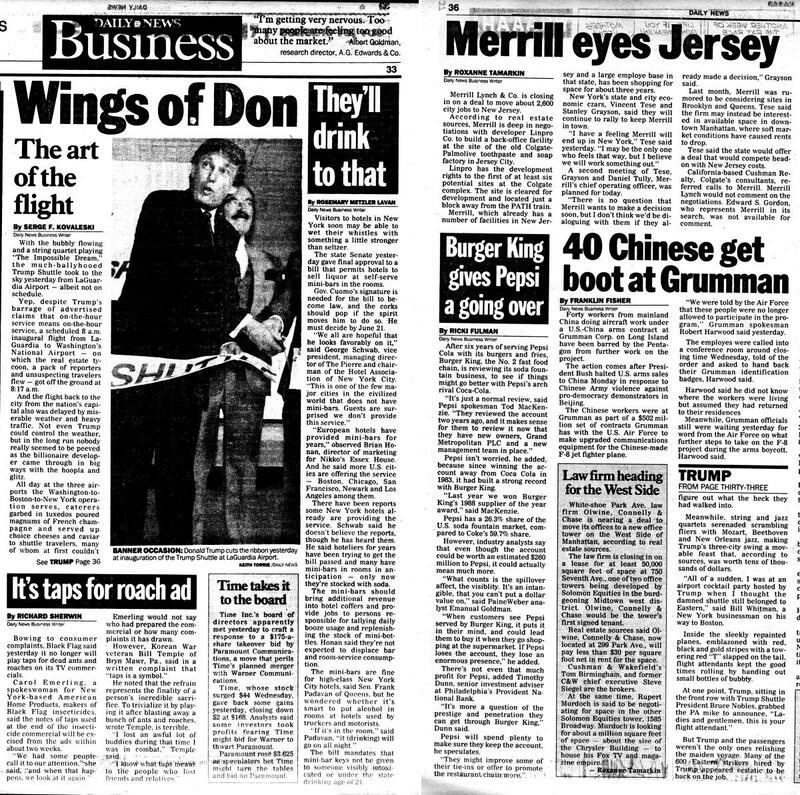 While working for the New York Daily News, Kovaleski spent most of a day in the summer of 1989 with Trump when he was trying to get the Trump Shuttle started. As an aside, for those trumpeting the successful businessman side of Trump, the airline defaulted it’s loans (a common occurrence in the world of Trump financing) and creditors assumed ownership of the airline about 14 months later. 14 months without a profit, of course. Kovaleski, with other reporters, flew up and down the east coast with Donald Trump aboard exclaiming the virtues and impending success of his new acquisition. All the reporters got schmooze time with “The Donald”. The second paragraph of Kovaleski’s piece sealed the deal for his relationship with Donald Trump, it wasn’t complimentary. Kovaleski noted that the inaugural flight of the “on the hour” service actually departed at 8:17 a.m.
“Trump and the guy who was running the Trump Shuttle for him … called me the day the story ran and Trump started screaming over the speaker phone about what a piece of sh– the story was,” Kovaleski said. That sounds like it’s true, if you’re familiar with the history of Trump. Kovaleski was tasked with covering the Trump bankruptcies as well, and maintains he was on a first name basis with Trump for an extended period of time. He interviewed Trump in his office, so Trump was certainly aware of Kovaleski’s mannerisms and ticks associated with his disability. Some people, despite hundreds of other recent examples of insulting and shocking statements from the same source, will ignore the boorish bigotry of Trump and cast their vote for a guy that “tells it like it is.” These thousand or so words aren’t for them. Nobody can prove the motives of a human. In this case, however, we can come close to 100% certainty that the candidate in question definitely intended to mock one specific person and, worse, that person’s physical disabilities. How, you ask? If one needs “proof” that Donald Trump mocked a reporter’s physical disability, feel free to examine hundreds of hours of recorded video featuring the GOP candidate for President of the United States and find one other instance where he uses those gestures. You Didn’t Find One, Did You? There are THOUSANDS of examples of Donald Trump insulting and mocking people available for public viewing. That fact, in itself, should disqualify the man from consideration for a vote based on his thirteen year old bully behavior. In those examples, you will not find him making those “generic gestures” as he described them despite most of his speeches being structured and delivered like a bad standup comedy routine. When called upon the carpet for churlish behavior, the candidate immediately emulates a toddler caught with his hand in the cookie jar. He deflects, accepts no blame, and distracts with unrelated chatter. This author is hereby publicly volunteering his services for some sensitivity training for Donald Trump. Cash up front, of course.